These sites are managed in accordance with the relevant data protection legislation in the UK. The data controller is End Of The Road Festival Ltd of Studio 14 Hackney Downs Studios, 5 Amhurst Terrace, London E8 2BT (“EOTR”). The ticket purchase website is controlled by End of the Road Festival Ltd but hosted and managed by Festival Pro Ltd, RAD Labs, 64 Cropley Street, N1 7GX . 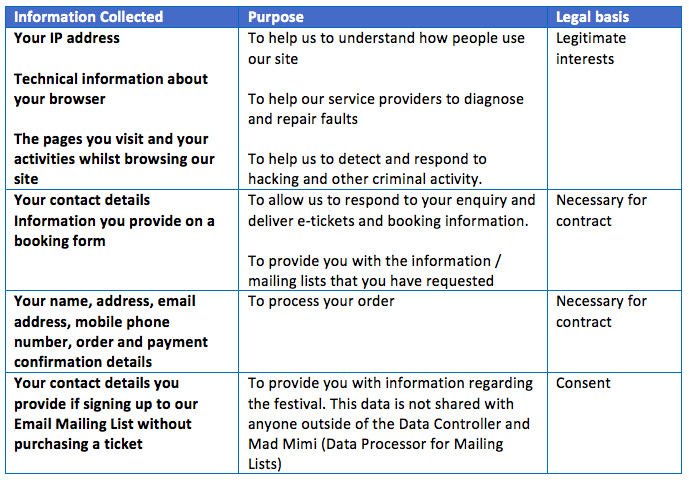 Festival Pro are contracted to EOTR as a Data Processor as defined with the GDPR regulations. You can contact our privacy officer at the address above or by emailing info@endoftheroadfestival.com – please use “DPO” as a reference in the subject line to ensure your enquiry is handled quickly. Please note that this list only applies to your use of our websites. If you interact with us in other ways, then additional privacy notices detailing other information and purposes will also apply. For the avoidance of doubt, End of the Road Festival Ltd does not store any payment details (i.e. card numbers) as these are securely held within the PayPal and Stripe systems – both of which are compliant with GDPR legislation. When you purchase a ticket for the festival, your email address will be added to our Email Mailing List so that we can send you information regarding the festival. Our Email Mailing List is managed by Mad Mimi who have confirmed their GDPR compliance. You are able to unsubscribe from this Email Mailing List at anytime using the “Unsubscribe” button on any newsletter you receive. PayPal – customers are able to use this online payment platform to pay for their ticket order. Please note that as detailed above, End of the Road Festival Limited do not store credit card or payment details that a customer enters when using PayPal. Stripe – customers are able to use this online payment platform to pay for their ticket order. Please note that as detailed above, End of the Road Festival Limited do not store credit card or payment details that a customer enters when using Stripe. All of our data processor partners have been contacted and confirmed that they are aware of the GDPR compliance requirements and will have their own policies in place. Due to the nature of cloud based systems and storage, from time to time some information is stored and processed outside of the EEA. If you have any questions about the information we hold, how we use it or how to exercise these rights, please contact us using the contact details above. You can also use the opt-out facilities provided in our marketing emails and in the settings on our website to change your preferences and consents at any time. Also, some videos embedded in our pages use a cookie to anonymously gather statistics on how you got there and what pages you visited.